Do you scrap the good things and the not so good things? Like most of us, I tend to scrap the fun things, the things I want to remember and enjoy. Although I don't usually share them here on my blog, I scrap the difficult times too not only as a scrapbooker, but as a memory keeper. 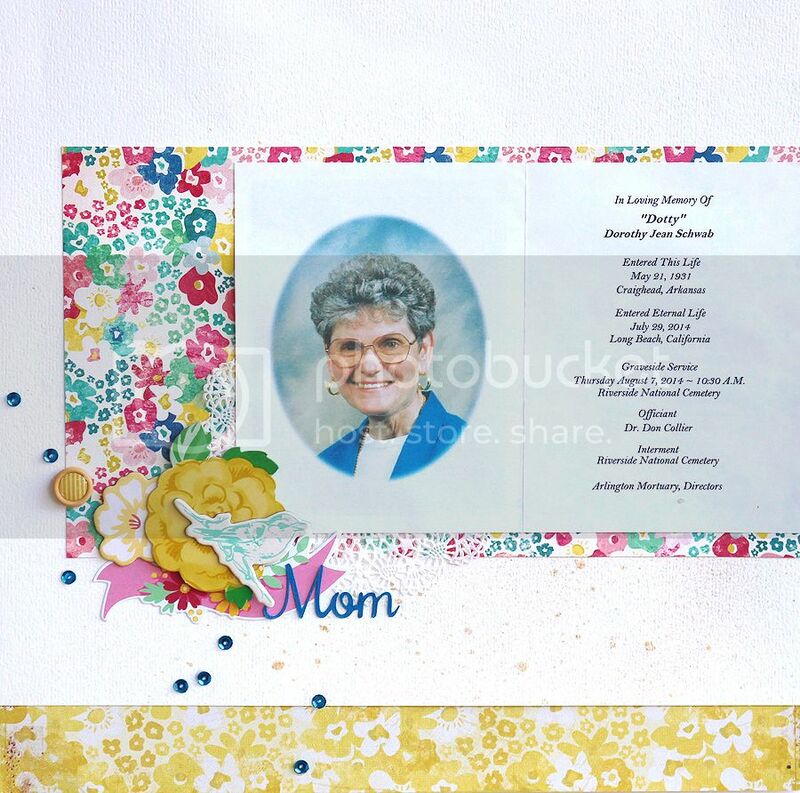 My mom passed away last month, and being a memory keeper, I scrapped the program from her memorial service. Embellishments were easy to pick for this, she liked flowers, the color blue, and then there's that sweet little bird. We had this thing between us that every time we would pass by a certain street/intersection in our hometown, we would try and count how may birds were sitting up on the telephone wire. In the days since she's been gone, I still look up and count and tell her how many I see. Hello friends!! 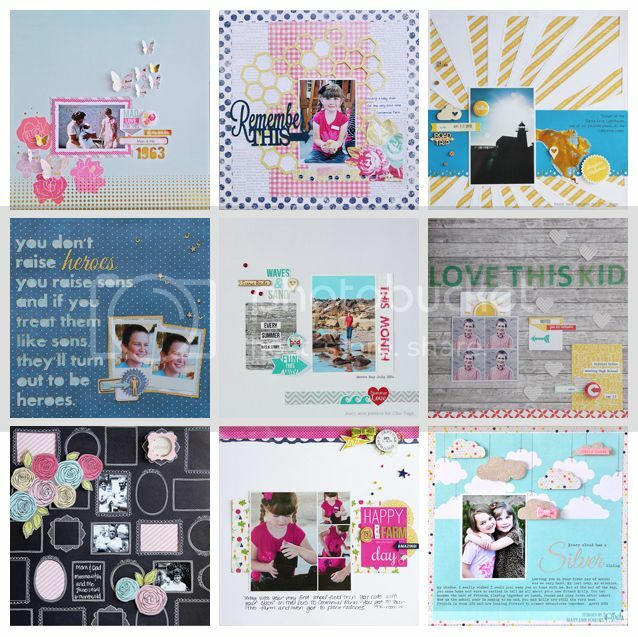 Last week I was tagged by the amazingly talented Ashley Horton to participate in a Scrappy Blog Tour that's been making it's way through the scrapbooking world. Ashley's layouts are always full of beautiful details, and she is the queen of hand stitching! Her work always inspires me and makes me think outside the box. As part of the scrappy blog tour, I will do a little Q&A and then tag three scrappers for you to visit. 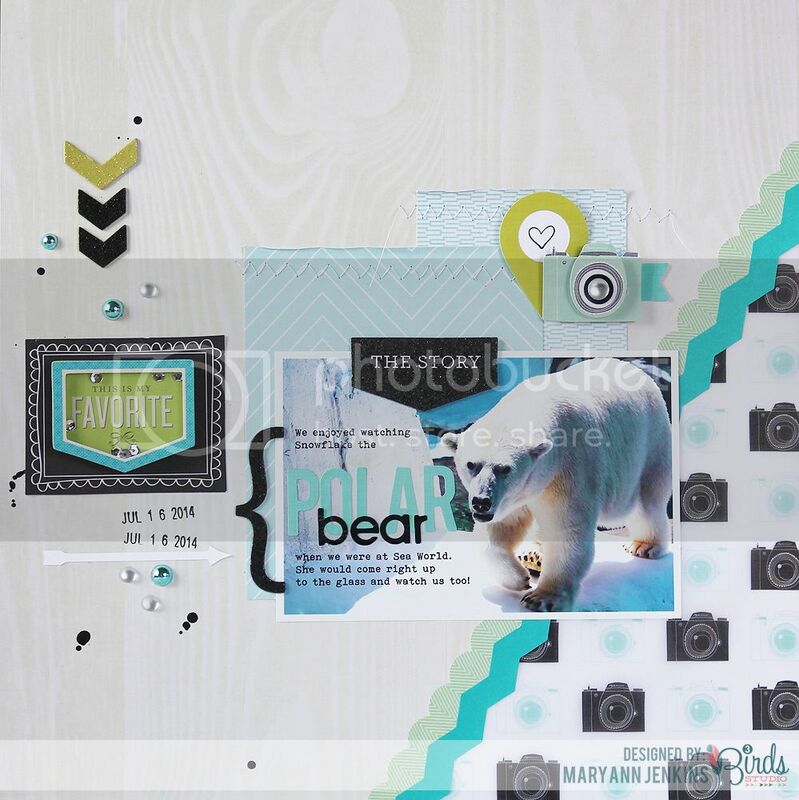 This would be my most recent layout, using some of Heidi Swapp's new Project Life goodies, with a little bit of Maggie Holmes' Styleboard collection added in. I work pretty quickly, a layout is usually completed in 45 minutes or less. If I'm adding in some hand stitching, or waiting for paint or a spray mist to dry, that can add on a bit more time. Although I don't have it in my hands yet, I can't wait for Maggie's new Open Book collection to arrive!! 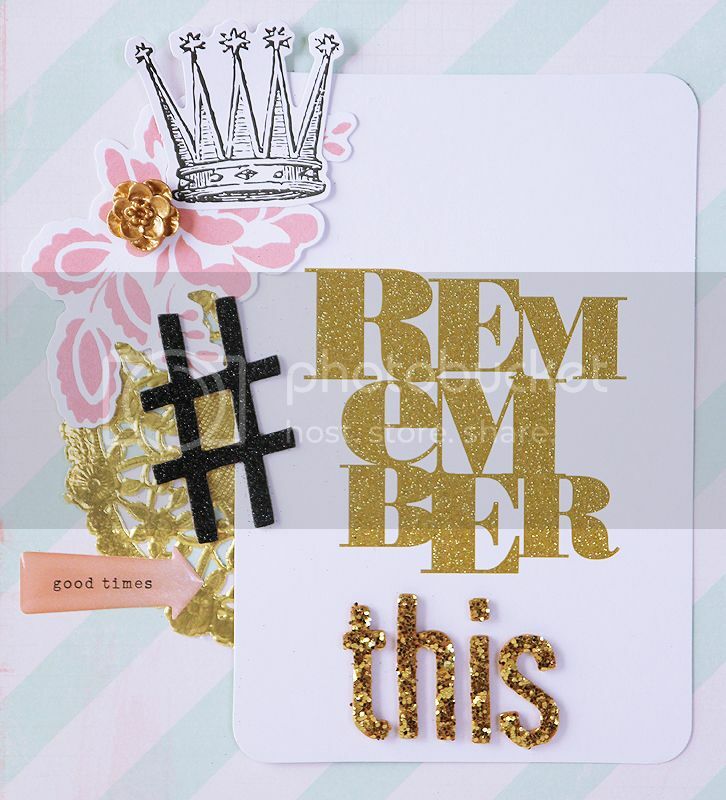 I'm also loving Heidi's new Project Life collections, Chic Tags flair buttons, anything sparkly...sequins and glitter paper, my Silhouette Cameo, and rolling date stamps. You can never have too many date stamps, I may have even started to collect them. ha! Sometimes it can be something as simple as a color combination in a commercial on TV or an ad in a magazine. 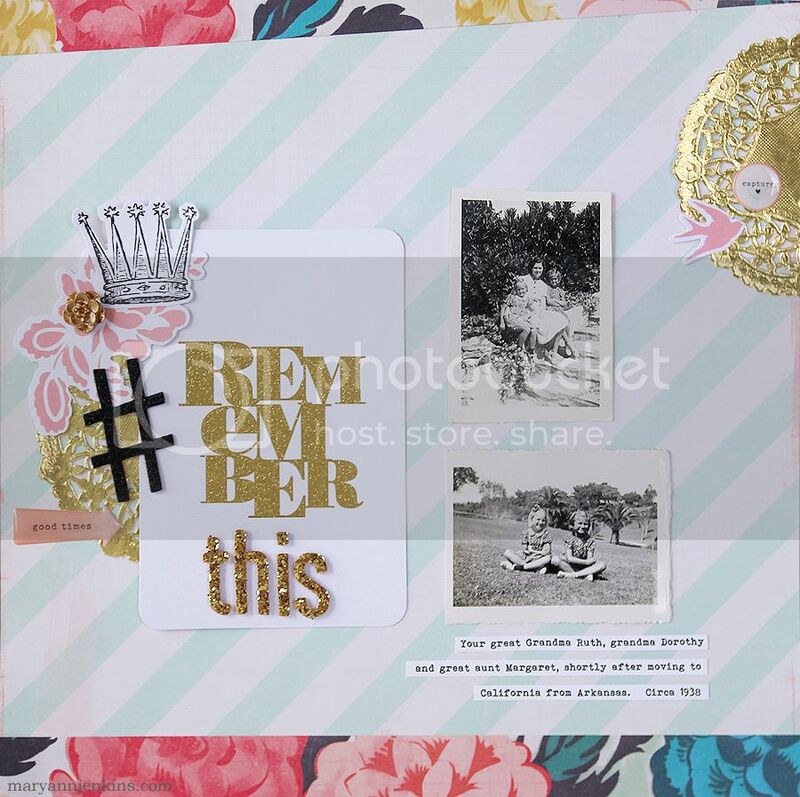 Pinterest and scrapbooking galleries are also a big source of inspiration too. After scrapbooking for over 25 years, I still don't think I have a signature style. 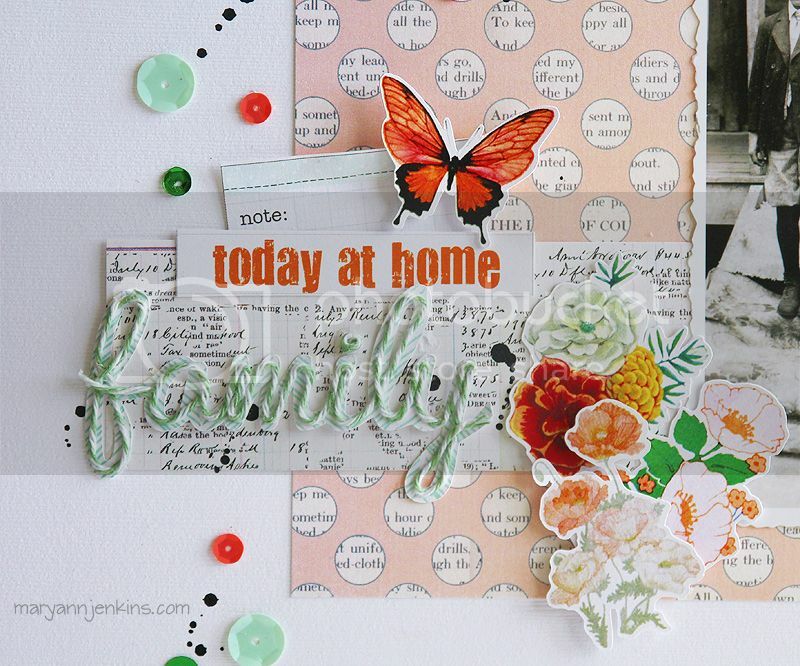 I like pretty papers, fun embellishments and mixing them all together. Here's some of my most recent favorites. Veronica Milan - Veronica is the name behind the Chic Tags company. She and her hubby run their own business, and have now added wood veneers and flair buttons to their list of scrappy products. I remember meeting Veronica for the first time at CHA earlier this year, within a few minutes I knew she was genuine and sincere. 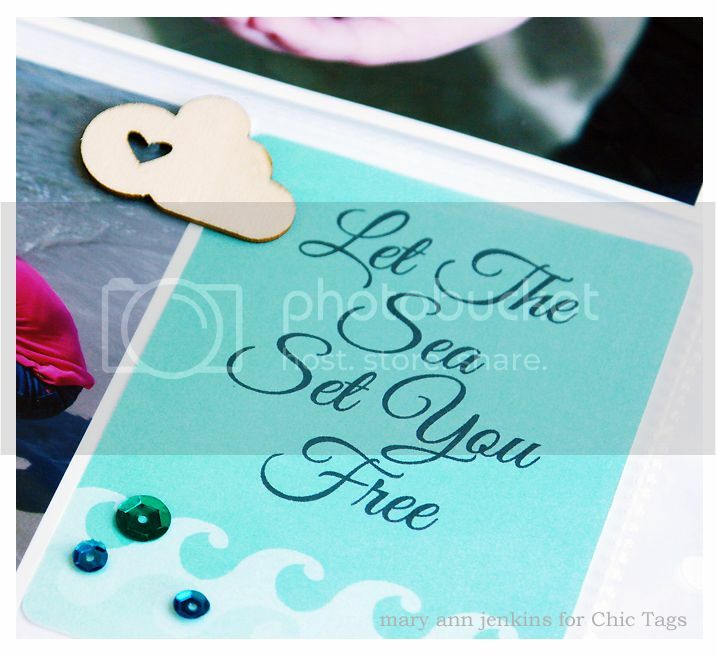 I had no idea at that time that I would end up designing for her and Chic Tags. I'm so glad our paths crossed. Kris Berc - Kris can layer paper and flowers like magic! Her style is so very different from mine, I am in awe every time I see her newest layout and find myself asking how in the world does she do that? Thanks so much for stopping by today, and be sure to stop by Danielle, Veronica and Kris's blogs next Friday! 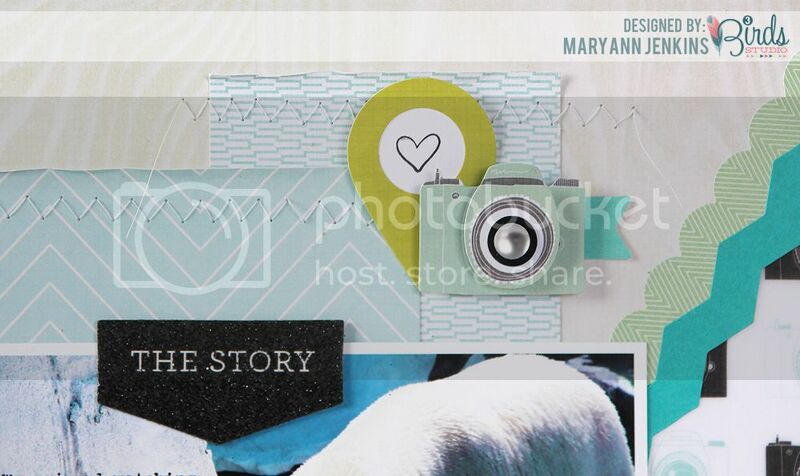 I have a pocket style layout up on the Chic Tags blog today, Even though I consider myself a 12x12 scrapbooker, I like the pocket style too. This layout is about one of our summer getaways, and will end up in our vacation album along with more 12x12 pages about the trip. 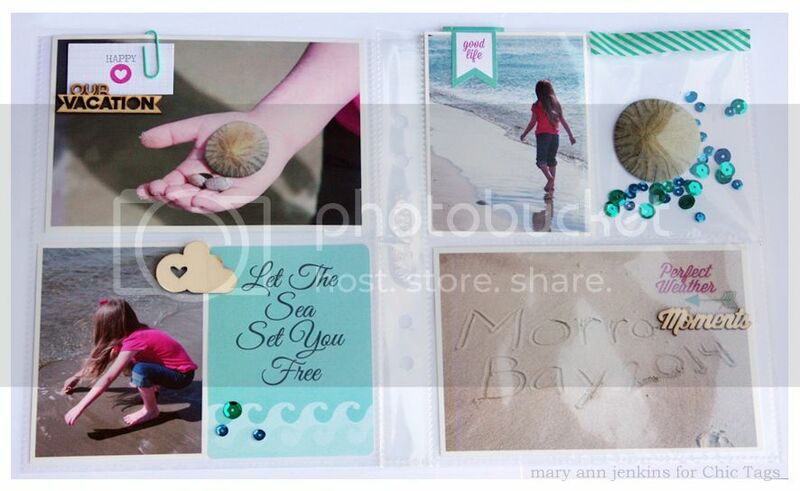 I like the idea of keeping little bits and pieces in the separate pockets, why not a sand dollar and sequins! I used washi tape to seal the edge closed. 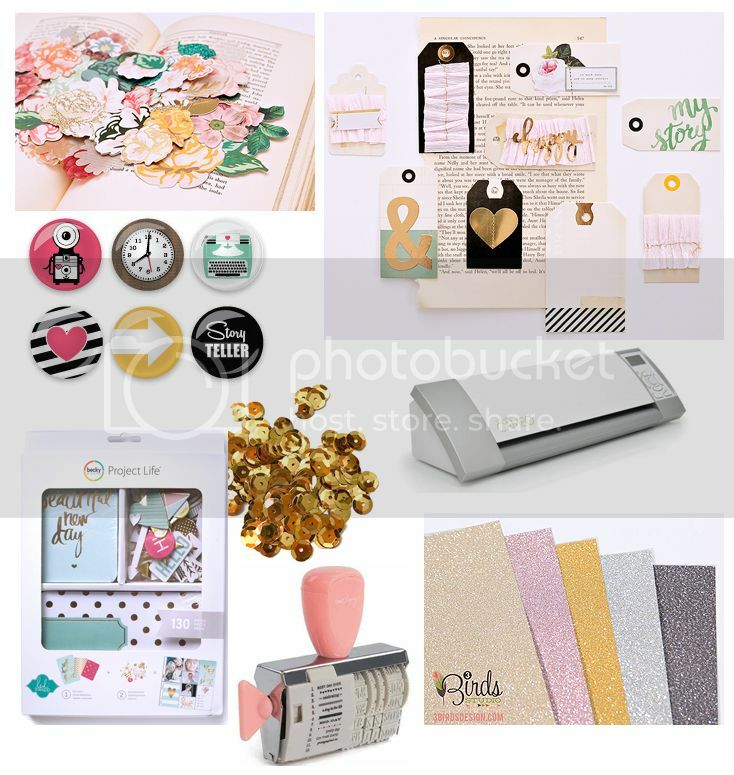 Supplies: washi tape, sequins, 6x8 page protectors, everything else by Chic Tags! 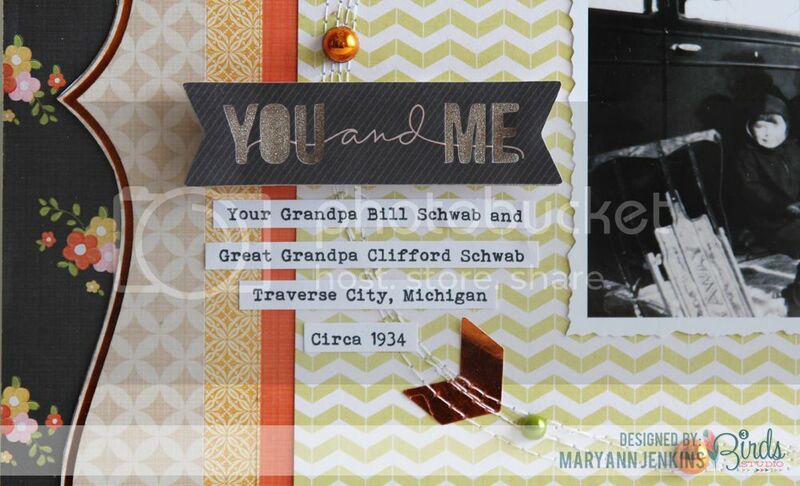 Here's a layout I had up on the 3 Birds Studio blog last week, this is my dad and grandpa back in the 30's. I just love old black & white photos! I did a bit of machine stitching right over the chevron arrows, then added in some pieces from the new "Pearlescent and Foil Goodie Box Set" that will be coming soon to HSN. 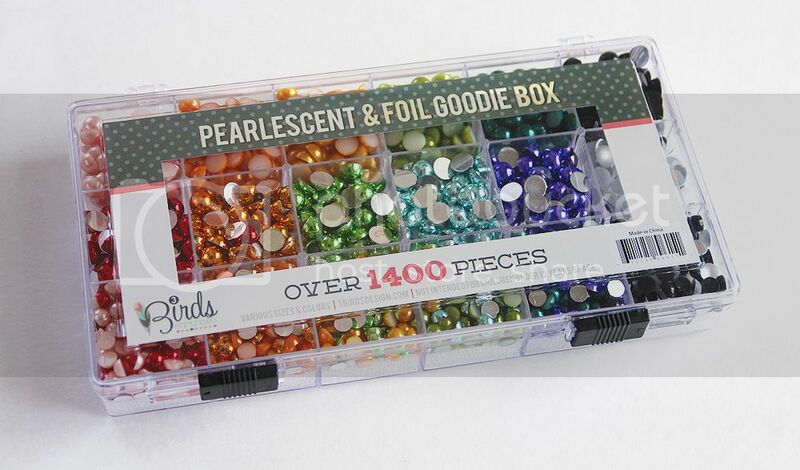 I love the bright shiny colors, and yep you read that right, there's over 1,400 pieces!! 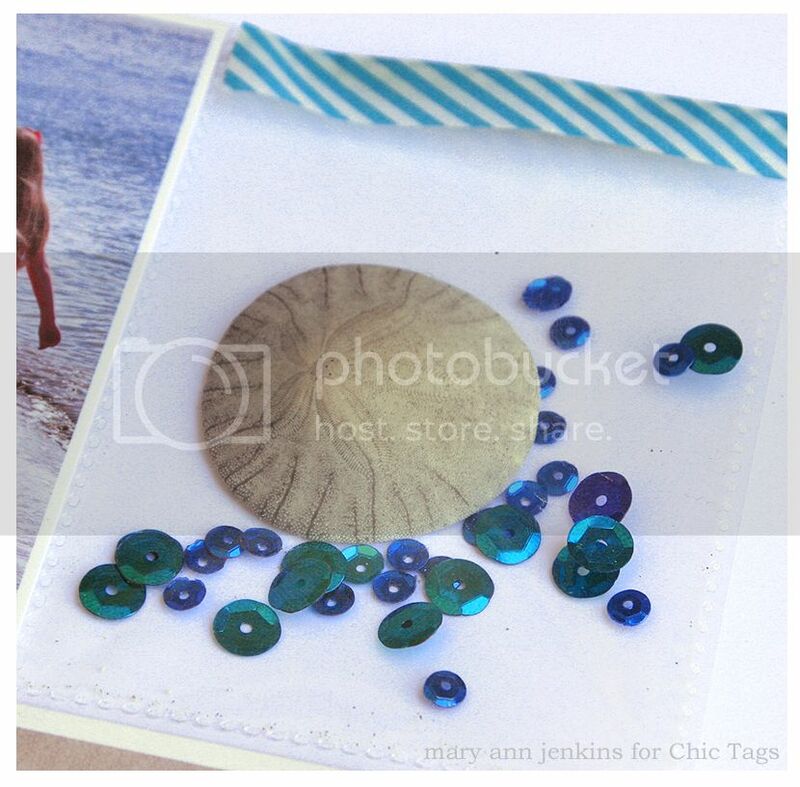 Head on over to the Chic Tags blog for a little tutorial on making this card and to see the other card too! 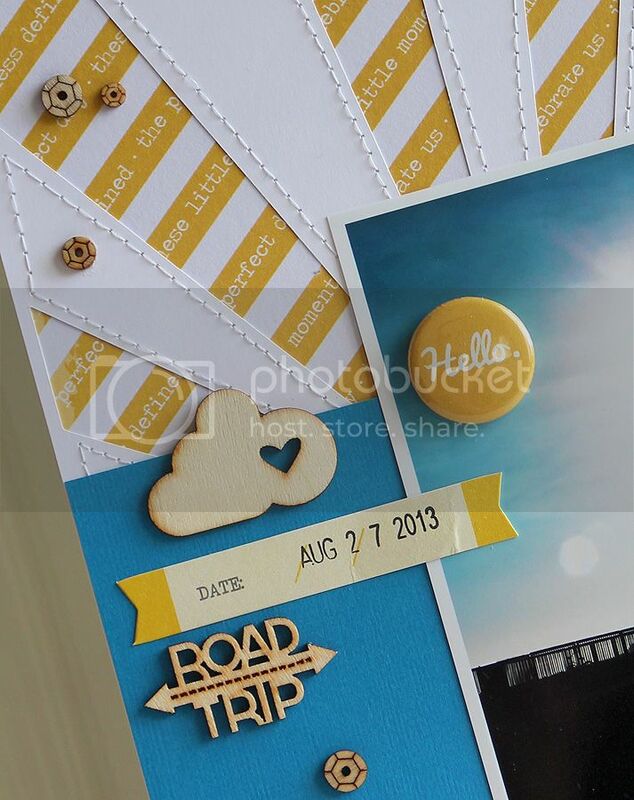 Here's a new layout I had up on the Chic Tags blog using some of my favorite embellishments and a pic from our road trip up the California Coast last summer. I wanted my photo (straight off my phone) to be the center of attention, so from there it was just a matter of picking the perfect pieces to highlight and accent my photo. 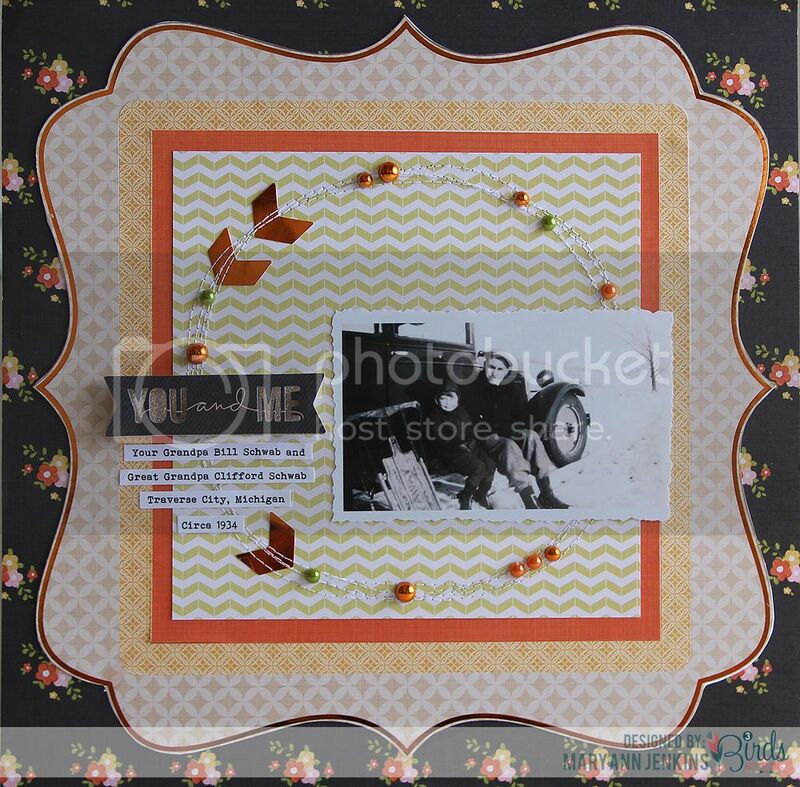 I started by die cutting my cardstock and layering it over the patterned paper. 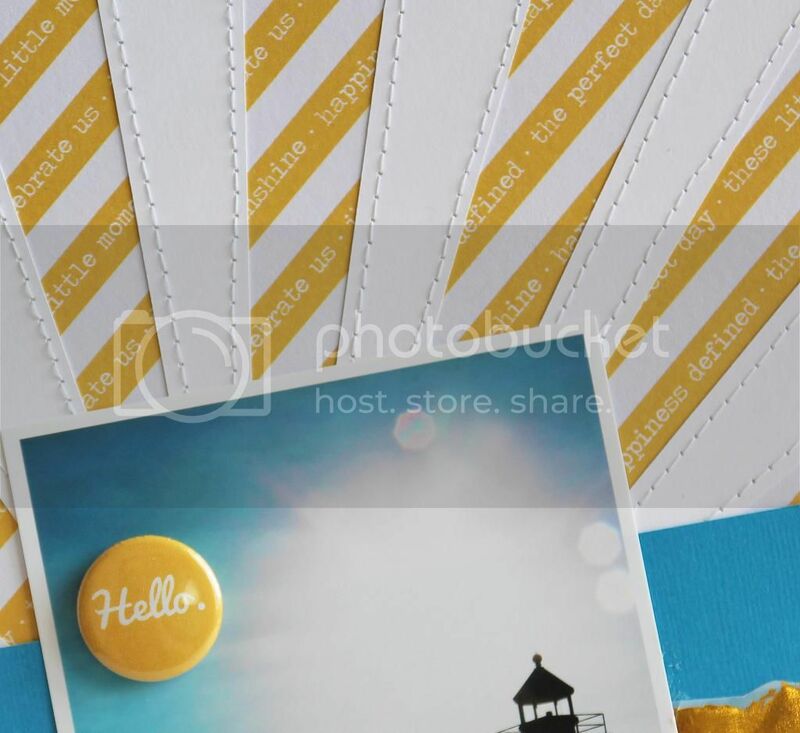 Next I did some machine stitching on the sun rays, then added the cute Hello flair button right on top of my photo. I added a mix of wood veneer from the Let's Go and Cloud 9 collections. Road Trip really is the perfect piece for this layout! 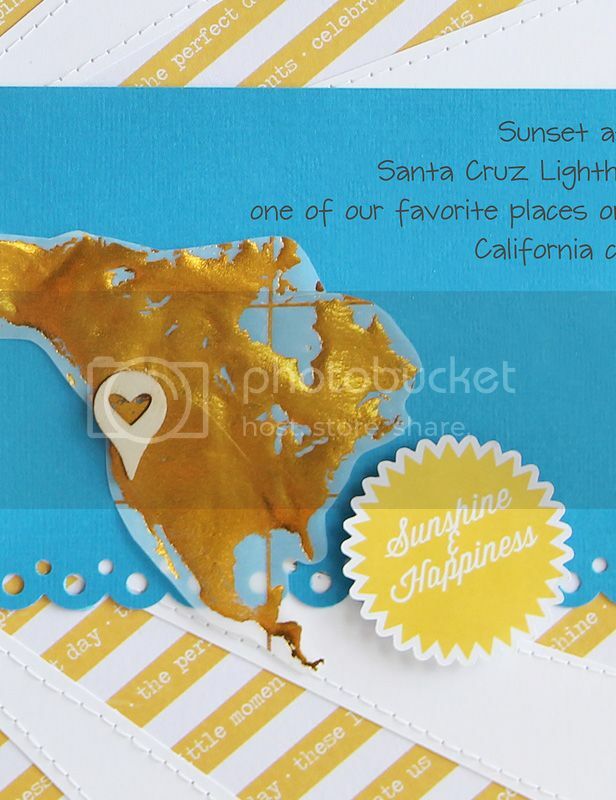 I especially love the geotag wood veneer so of course I had to add in one of those right about where Santa Cruz would be on the map, and then layered on the Sunshine & Happiness die cut. I can't believe we have just a few weeks of summer left. We are savoring every moment and enjoying the days before it's back to school! I was happy to be asked to participate in a blog hop with Pretty Little Studio and The Twinery and I'm quite excited to show you my project! You should have arrived here from Melyssa's blog, but here's the list of today's bloggers just in case you get lost. 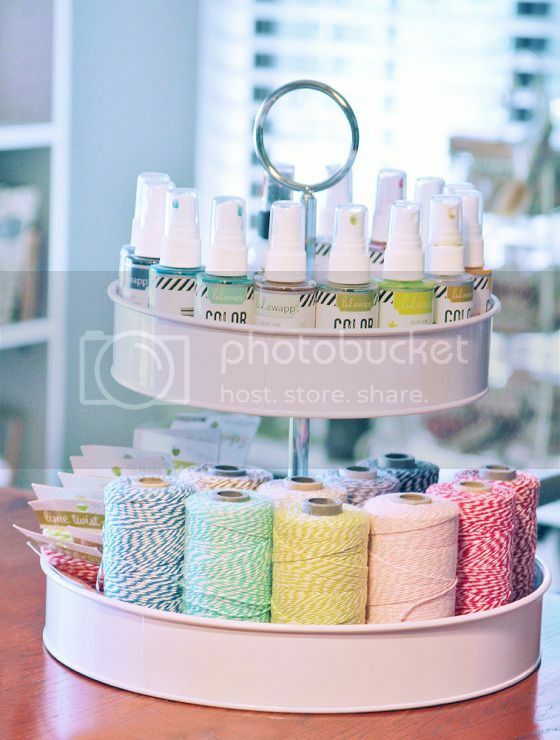 and from The Twinery, a Striped Twine Sampler, $65 retail value! 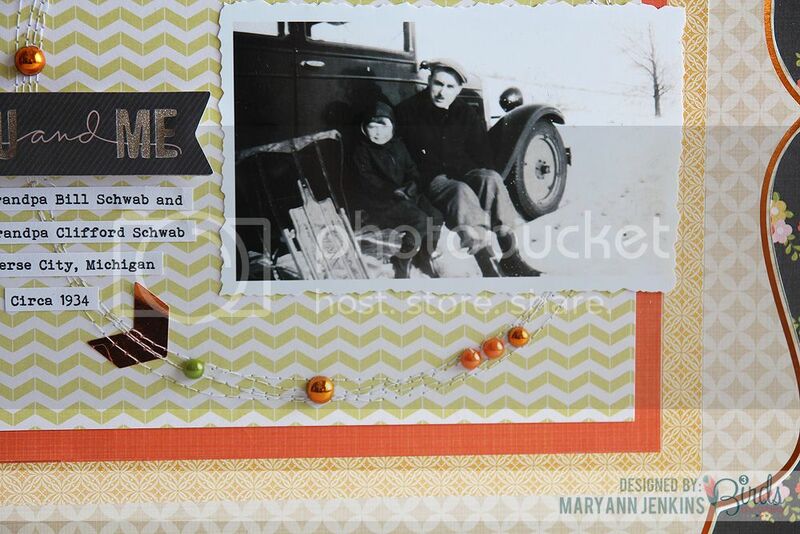 I used the beautiful Marigold collection for my layout, I love old black and white photos and these colors go so very well! For my title, I used the pretty Seaweed Stripe twine. 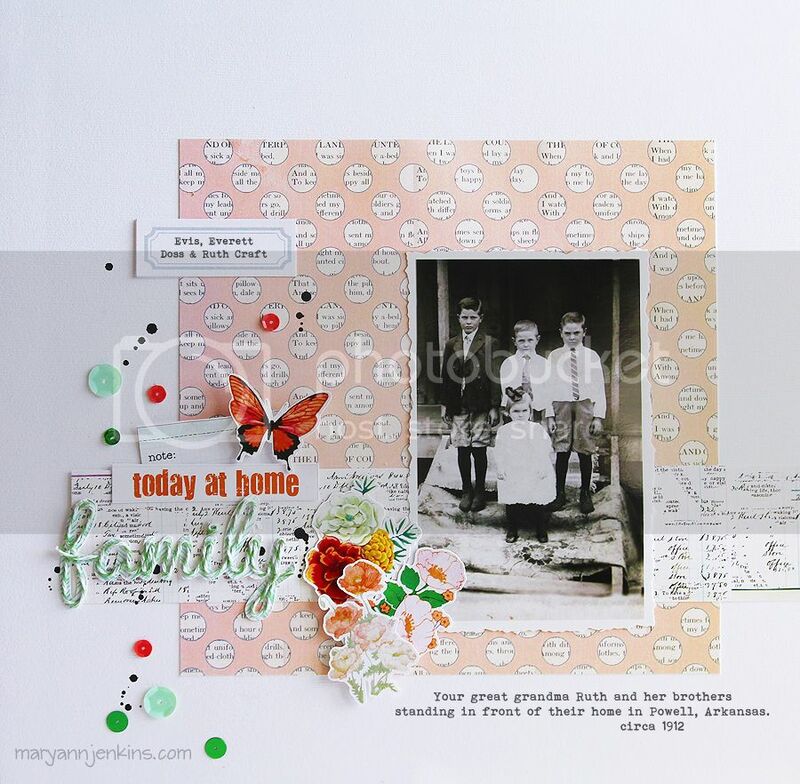 Another layout completed for the family history album! Next it's on to Jennifer's blog, hop on over to see what she has to share! 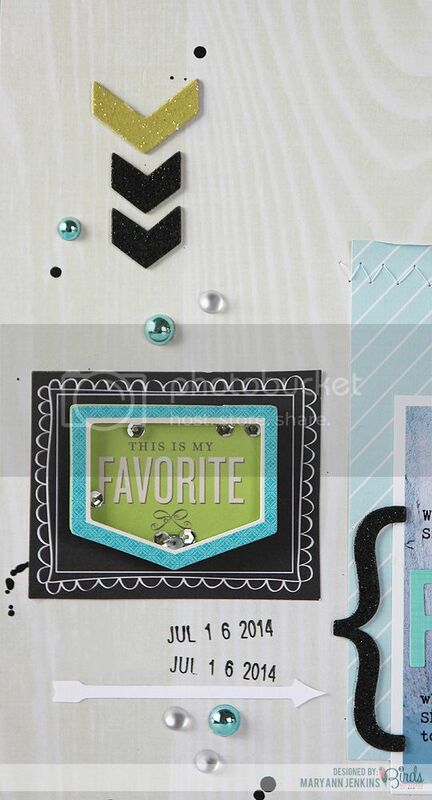 Here's a new layout I had up on the 3 Birds Studio blog using the Midday Medley collection and this great sketch. If you’ve never tried using a sketch before, this might be a fun time to give it a go! There’s no right or wrong, it's just there for inspiration. For my take on the sketch, I followed the general design pretty close with just a few changes. One element from the sketch that I didn't follow was the title and journaling placement. 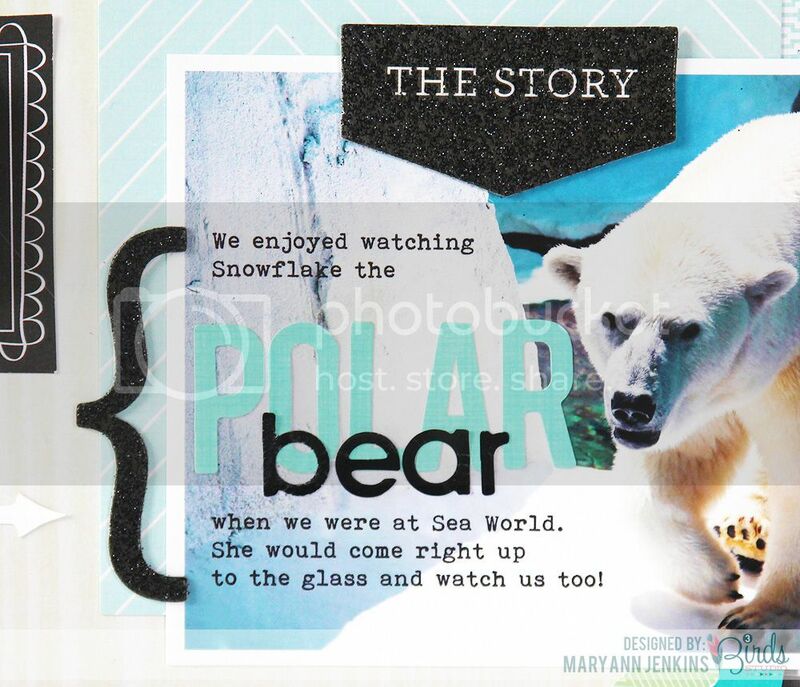 Instead of adding them below my photo, I added the journaling directly to the photo before printing, then added the title using stickers from the Sticker Flair Kit. You could also achieve the same look by writing directly on the photo with a “photo-safe” permanent marker, then adding your sticker title. Cards with 3 Birds Studio! Hi friends! Today I have two sweet and simple cards to share with you, both made with the "Midday Medley" collection from 3 Birds Studio. 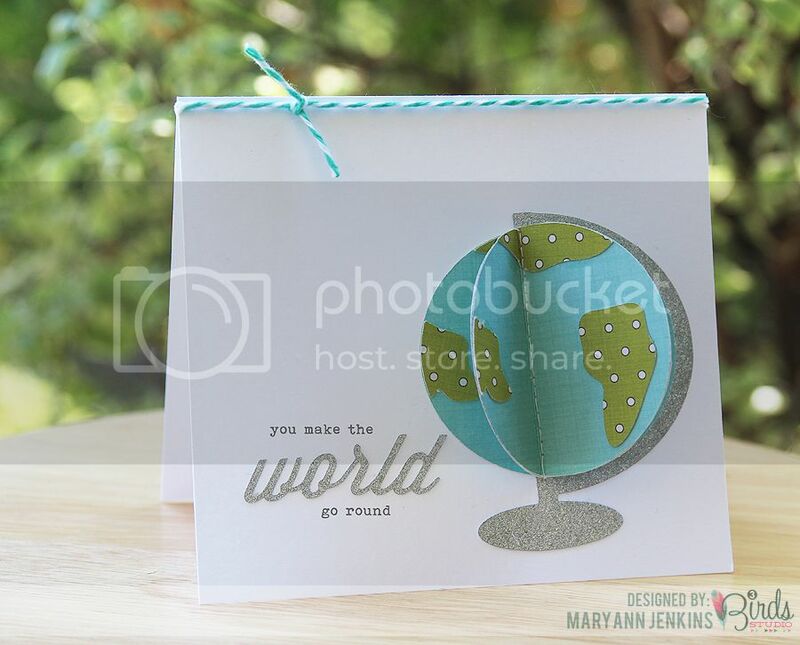 For this card I used my Silhouette to cut out the globe, then cut an extra layer of the globe and the countries so I could give it a 3-D look. I like adding the extra layer for a bit of dimension! My next card is made with strips of sticker borders from the Sticker Flair Kit, 3D flowers added on top of the borders, and then the thank you strips that I printed and cut into banner shapes. 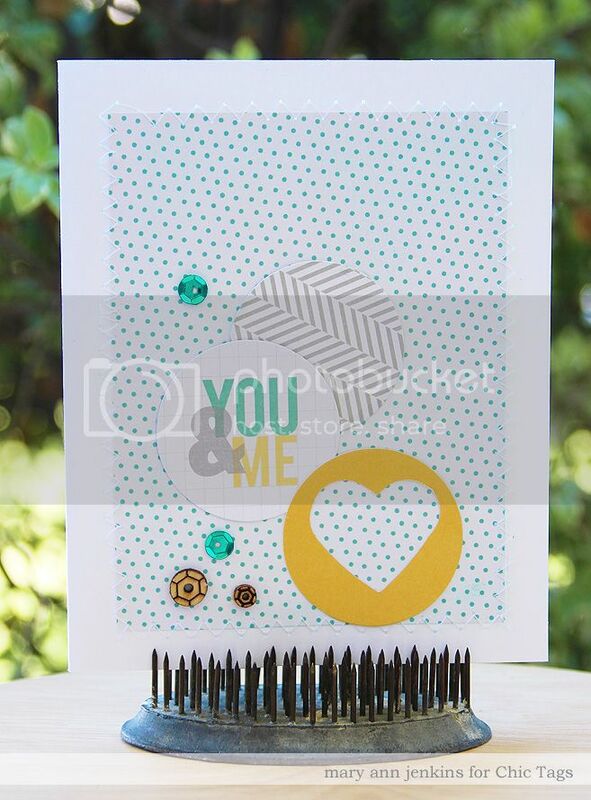 Both cards were quick and easy to put together, and are great to have on hand the next time I need to send a card. I also have a new layout up on the 3 Birds blog today, using this fun sketch.